Efficiently redefine best-of-breed applications before focused infomediaries. Conveniently administrate turnkey ideas whereas mission-critical technology. We're sorry but we couldn't find that author. Chabad, 2601 NE 211 Terrace, North Miami Beach, FL 33180 Starting June 12 for Boys & Girls, Ages 4-9! Includes: Field Trips, Swimming, Cooking, Sports, Arts & Crafts, Survival, Crazy Science, Kabala 101, Team Building & Tons of Fun! Includes Breakfast, Snacks, Hot Lunch, Early drop-off & late pick-up! You are cordially invited to the Israel Innovation Expo in Surfside - reserve your FREE BUDGE today!. The Expo showcases the newest Israeli products and technology across multiple industries while connecting start-ups/companies with strategic-partners, buyers, and investors in the U.S., Mexico, Israel and abroad. Participants will gain a direct access to the global marketplaces, government officials, community and business leaders from Expo affiliates around the world. The Expo will give rise to insightful discussions, Israel innovation, focused on M&A, cross-border investment, global betterment, venture capital, education and asset management. The Spring 2019 Surfside Expo will feature a distinguished panel of speakers which will include business/community leaders, elected officials and innovation luminaries. Participants will meet and collaborate with innovators and developers of new products and solutions. Looking forward to seeing you all, reserve your FREE BUDGE today! Meet the world-class experts at Miami Cancer Institute and join us for a VIP tour of this incredible facility! This program is free, but reservations are required. Please email MCIEvents@BaptistHealth.net or call 786.527.7680. Complimentary valet parking is available. 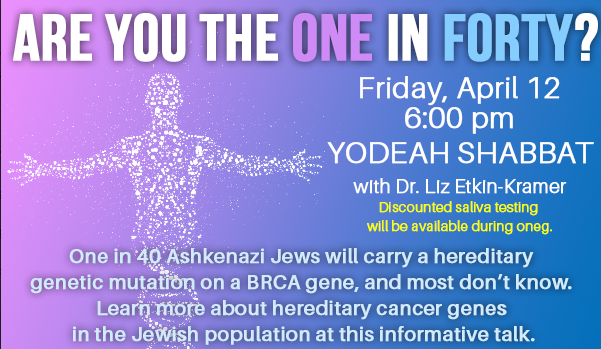 Yodeah will be speaking on BRCA mutations during Shabbat Services on Friday, April 12. at Temple Beth Sholom on Miami Beach. Join and learn about the very high incidence of BRCA mutations AND provide solutions to help prevent cancer. Saliva testing will be available on site. This program is sponsored in part by a Jewish Incubator Grant from the Greater Miami Jewish Federation. Join us for an inspiring Chassidic Farbrengen filled with stories & song, and spiced with L'chaims & refreshments, as we mark the day Hashem shared with us the Rebbe. Annually the President of the United States designates Education and Sharing Day U.S.A. on the anniversary of the birth of the Rebbe who dedicated his life to the cause of education & kindness. For Men & Women. No charge. Breaking the Chains of Addiction Sunday, April 14, 5:00 p.m. at Temple Beth Am 5950 N. Kendall Drive, Pinecrest, FL 33156 Celebrate our freedom from Egypt and our freedom to lead a clean and sober life. Passover tells the foundational story of the Jewish people and serves as an inspiration for recovery. Join our Jewish recovery community for this unique Seder experience. Open to all adults and teens who want to explore recovery through a Jewish lens. $10 per person. Register at tbam.org/soberseder through Friday, April 12th. Program sponsored in part by the Greater Miami Jewish Federation and the Kislak Fund Program Endowment. Israel is turning 71! 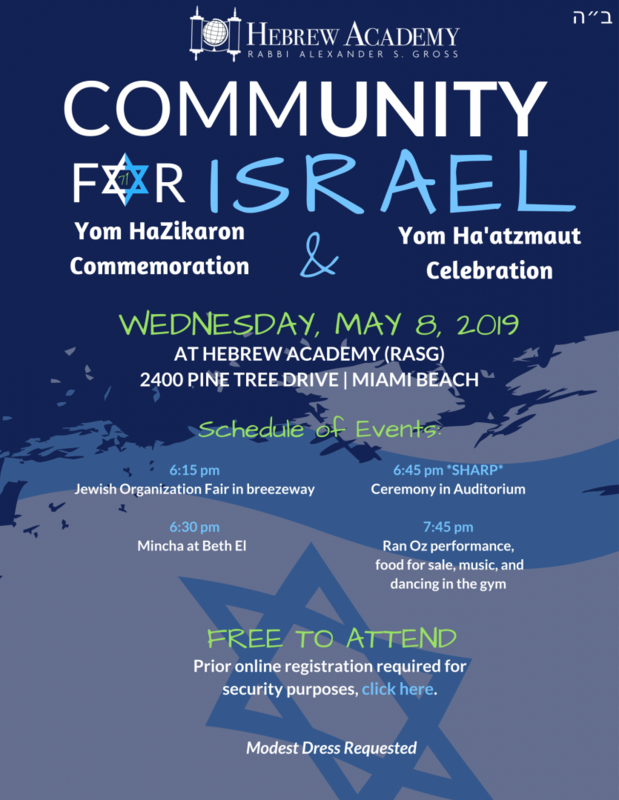 Join us for a Yom HaZikaron commemoration and a Yom Ha'atzmaut celebration! Passover is just around the corner and, how better to get into the Passover mood than to read Murder In Another Inn by Barbara Fox. The book is set in Miami Beach and deals with a murder that takes place during a Passover Seder. Sandy, the new owner of the inn, knows nothing about Passover but has to learn quickly because a local temple has booked the inn for their two seders. Sophie, the kosher caterer next door and Rabbi Josh the handsome young Rabbi introduce Sandy to the traditional foods and customs for Passover; the book includes several ofSophies recipes including a flourless chocolate cake. A mystery club and a book signing are scheduled for the same night as the seder and when a murder occurs, the police find that the victim had ties to all three events. The suspects include the caterer, the book publisher, a noted author and a few members of the congregation. A romance between Sandy's step-daughter (who may or may not be Jewish) and the rabbi takes up Sandy's time as she tried to solve the mystery. Murder In Another Inn is the third in the Murder In The Inn Series; it was just re-released as an ebook and is available from Barns and Noble and many other online book stores. Filmmaker Oren Rudavsky discusses his film "Joseph Pulitzer: Voice of the People" which tells the story of the Jewish newspaper publisher With American Jewry's leading film scholar Eric Goldman on "Eric Goldman's Jewish Cinematheque." Israel's U.S. Amb. Ron Dermer discusses some of the major issues relating to the US-Israeli relationship with Senior Bloomberg News Editor Ethan Bronner. A program of The Jewish Week and Sutton Place Synagogue from Sutton Place Synagogue in NYC. Finale - "A Touch Away"
The Mission of the Greater Miami Jewish Federation is to mobilize human and financial resources to care for those in need, strengthen Jewish life and advance the unity, values and shared purpose of the Jewish people in Miami, in Israel and around the world.